Texas A&M graduate student Luis De Jesús (left) and Texas A&M chemist Sarbajit Banerjee (right). Photo: Texas A&M University. Research conducted by an international team led by Texas A&M University chemist Sarbajit Banerjee and published in Nature Communications could lead to more efficient batteries by shedding light on the cause of one of their biggest problems. This is the ‘traffic jam’ of ions that can slow down the charging and discharging process. All batteries have three main components: two electrodes and an intervening electrolyte. Lithium ion batteries work under the so-called rocking-chair model, in which discharging and charging is likened to the back-and-forth motion of a rocking chair. As the chair rocks one way, using up the battery’s stored energy, lithium ions flow out of one electrode through the electrolyte and into the other electrode. Then as the chair rocks the other way, charging the battery, the reverse happens, emptying the second electrode of lithium ions. "Fundamentally, when you have a battery, every time you use it, it starts to die a little bit," Banerjee explained. "The more you use it, the more it dies. Eventually, it becomes unusable. Theoretically speaking, you expect a certain performance from a battery, and you rarely ever get there. People have been at a loss to understand all the factors that contribute to this lack of full capacity. This study points us in that direction." Banerjee conducted the study in conjunction with collaborators from the Lawrence Berkeley National Laboratory, Binghamton University and the US National Institute of Standards and Technology (NIST). Using one of the world's most powerful soft X-ray microscopes – the scanning transmission X-ray microscope (STXM) at the Canadian Light Source (CLS) – they were able to image a traffic jam of lithium ions chemically driven through the nanowire-based channels of a simulated battery. "For a battery to function properly, you need to get lithium ions in, and you need to be able to pull them out," Banerjee said. "Once our lithium ions got in, we were seeing that they sort of stop at some point along the way." Banerjee points to this interruption as a veritable ghost in the machine that not only slows everything down but can also sometimes prevent an electronic device – be it a cell phone or a laptop computer – from exploiting its full battery potential. He says the devil is in the detail, which in this case clearly shows that the electrons, once coupled with the lithium ions, appear content to sit still instead of moving freely. This distorts the electronic structure and, in essence, traps or strands the flow of energy. Two of Banerjee's graduate students, Luis De Jesús and Gregory Horrocks, are joint first authors of the Nature paper, and worked with a third Texas A&M graduate student, Abhishek Parija. Berkeley Lab staff scientist David Prendergast and postdoctoral fellow Yufeng Liang at Berkeley Lab's Molecular Foundry, a US Department of Energy National User Facility for Nanoscale Science Research, helped the Texas A&M team design and implement their calculations. These calculations were then experimentally verified by colleagues at Binghamton using the NIST National Synchrotron Light Source beamlines at Brookhaven National Laboratory, supervised by Daniel Fischer. Calculations were conducted using Molecular Foundry as well as Texas A&M computing resources. Prendergast notes that the team's work demonstrates how X-rays can ‘see’ small polarons – the combination of a charged particle (electron) and an associated structural distortion – through their impact on the electronic structure around the oxygen atoms in the cathode. Scientists had already proposed that polarons were involved in the transport of lithium ions within Li-ion cathodes, but they had not been ‘seen’ directly until now. In order to make way for additional lithium to enter the cathode, Prendergast says, the lithium ions need to diffuse inside the cathode, bringing their electrons with them. But as small polarons, the electrons also have to carry along the structural distortion – a real drag for transport of charge in a material. "Imagine wanting to move a house to a different site," Prendergast said. "A wooden house can be transported in one piece, but a brick or stone house might have to be dismantled or demolished first." Once the lithium enters the cathode, there's a very slight distortion that causes the electrons to get trapped in a plane, where they form what he describes as ‘puddles of charge’ that are unable to link up and move as they should through the material. "You can always draw an analogy between water and electrons," Banerjee said. "They are making these little puddles, but until the puddles are connected, they can't flow. Once you have enough electrons coming in, they can all link up and start flowing. But until that happens, they're all stranded, and they can't move to charge or discharge something. And so they go out and hang in different areas of the particle. They're all sort of sitting, defining different regions, and they aren't able to move easily." Banerjee, who joined the Texas A&M Department of Chemistry in 2014 and is an affiliated faculty member in the Department of Materials Science and Engineering, has been working for a number of years to understand ion intercalation, the process by which ions like lithium move in and out of other materials. He says the resulting analysis can be applied in many different areas, including one of his group's specialties: designing better logic circuitry. "One of the things we look at is why do devices like cell phones and computers use up so much energy?" Banerjee said. "We're trying to develop new materials to make better circuits that are less energy guzzling. This work hones in on the problem, and it's a really good measurement. In the end, we were able to get to the bottom of the problem." A couple of years ago, while using conventional laboratory techniques to study the lithiation process in cathode materials, Banerjee and Horrocks realized that lithium ions would enter nanoscale structures much faster than they would larger structures. Right there and then, they made it their mission to figure out why smaller was faster – a quest that eventually led them to the CLS and an expanded research team featuring CLS spectromicroscopy beamline scientist Jian Wang. "Jian Wang was greatly instrumental, because the reviewers pushed us really hard on making 100% sure that what we were seeing was real," Banerjee said. "The Binghamton group helped us verify some of the predictions in theory. We had an observation; we calculated and matched that in models and then from there the models predicted some other things. They basically said, 'Well, if you're filling an electron into these certain states and they're no longer visible to you by X-ray imaging in a particular region of the spectrum, that means they're already full, so you should be looking for them somewhere else.' So the Binghamton group helped us look elsewhere, and we saw that, too. Once again, that really brings home the entire story." Binghamton physicist Louis Piper adds that his group has been studying polaron formation and migration in other Li-ion battery cathodes using this X-ray spectroscopy methodology. For this particular project, he says, their role was to confirm that the team's calculations were accurately predicting the polaron. 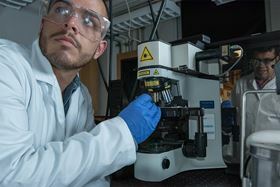 This involved making direct comparisons with another observation method, spatially-averaging hard X-ray photoelectron spectroscopy (HAXPES), which is able to probe occupied energy states. "The STXM is spatially-resolving but looks at empty states," Piper said. "In my opinion, the STXM shows the spatial effects of the polarons, which is very exciting, while the HAXPES confirmed the energies. The combination meant that we could use the calculations to artificially 'zoom in' with the model. I consider our role at Binghamton as keeping the calculations honest. It was nice to see all the approaches converge in this study." Ultimately, Horrocks and Banerjee agree that building a better battery boils down to figuring out a better way to move electrons. "There are two ways to solve the problem of moving electrons through cathode material better," Banerjee says. "One, you can make the stuff smaller or design architectures. Two, you can come up with entirely new materials, which is what we're trying to do. Basically, you prevent the electron from getting stranded because you design the material in such a way that it doesn't have orbitals where they would get stranded. You force them to always be de-localized. We have several materials in mind and are trying to get that research published."